A lot of DNA is shared among vintage bicycles, motorcycles, scooters and mopeds. 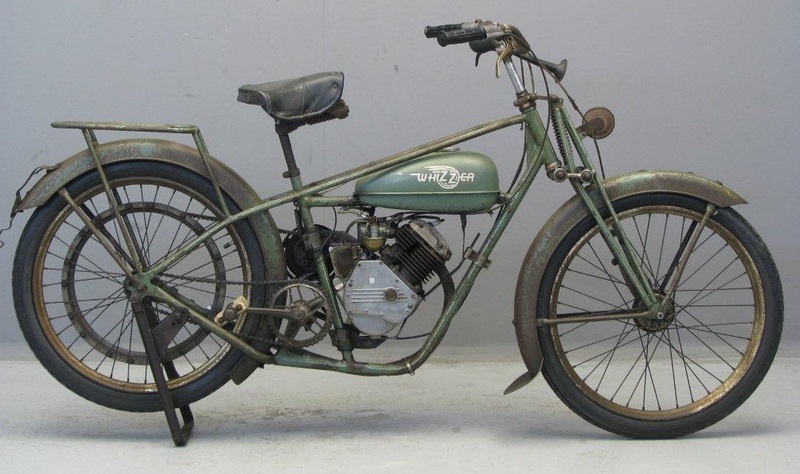 Pneumatic tires, Bowden cables, chain drive, frame and fork geometry, as well as components including stems, seatposts, handlebars, grips and brake levers were utilized in common across these vintage machines. I had an early introduction to scooters when my parents trucked home a Honda CT 90 to our rural farm back in the late ’60’s. Once the little motorbike was off the flatbed, I was stricken with intrigue. My parents made the mistake of “allowing” me to ride this little machine on the rural roads around our hay farm in the Applegate Valley of Southern Oregon. At age 12, I propped my 9 year old sister on the back, and proceeded to ride far afield of my parent’s requirements, even crashing the bike into a ditch in a particularly unpleasant and embarrassing experience. But most of the time, my spirits soared whenever I threw a leg over. Even though I had my internal hub 3 speed bike to explore logging roads and irrigation canals, this gas powered machine allowed me to venture much further beyond the limitations of my little kid muscles and my clunky 3 speed Sears-Puch diamond-framed bicycle. 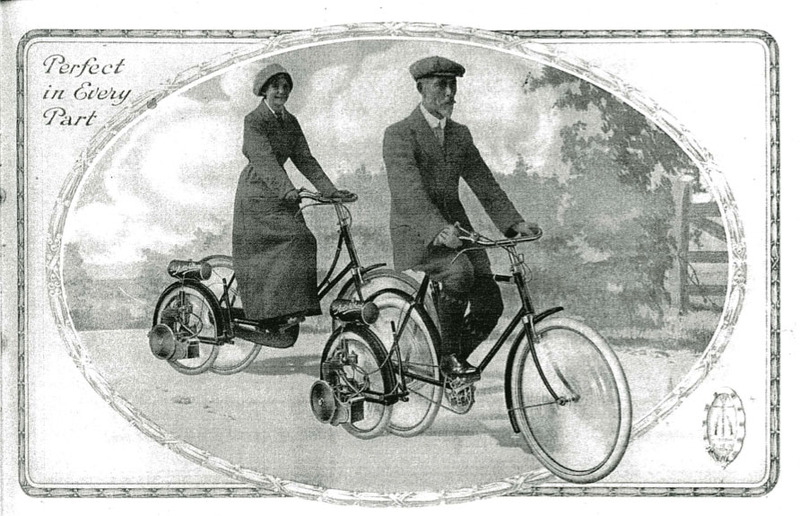 Motor-assist bicycles were first introduced over 120 years ago, back in the late 1890’s. By this time in history bicycles were widely accepted and utilized for transportation, leisure and sport, but with the advent of the internal combustion engine (first developed in 1794) inventors made headway with adapting an engine to a bicycle frame. 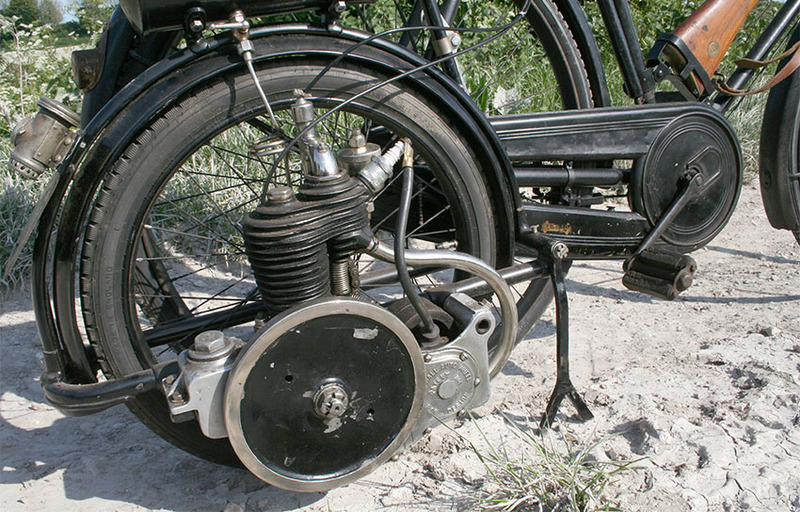 The above pictured bike utilized an air-cooled radial 5 cylinder engine incorporated into the rear wheel. The rear fender doubled as the fuel tank. It used a twist grip throttle, and could be started with pedals, much like modern mopeds. The bike reached a maximum speed of 21 mph at 180 rpms. The pedals served not only to start the bike up, but to provide for an alternative option should the engine fail. Another fascinating approach to power assist on a bicycle was developed by Wall Auto-Wheel. First patented in 1908, this device could be added to any bicycle. 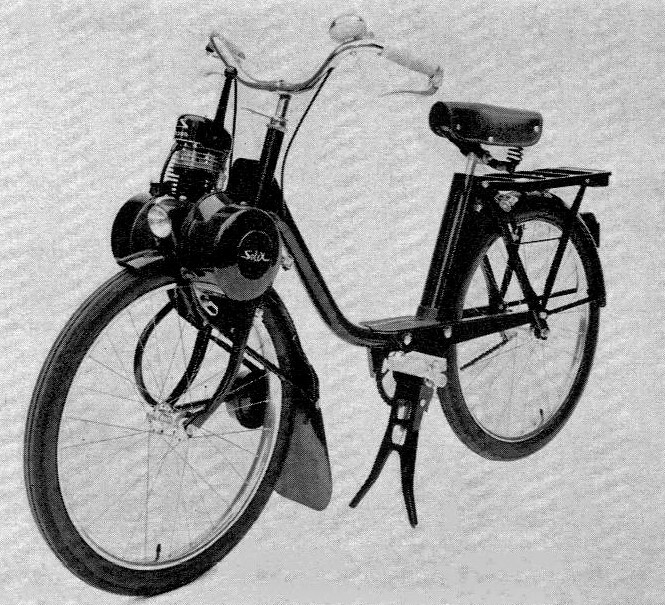 The 118 cc air-cooled single cylinder engine was mounted in a sub-frame which attached to the bicycle at three points. There was a lever control at the handlebars which operated the throttle. The whole unit was “lightweight” at 45 lbs. In the U.S, Los Angeles based Breen-Taylor Engineering developed the Whizzer bicycle engine in 1939. This was a motor kit which could be added to any bicycle. As you can see from the above photo, this was no small feat, and required many modifications and enhancements to allow this 150cc engine to perform with relative safety. Whizzers were often added to the very robust American steel frames offered by Schwinn and others during this era. After WW2, many different kinds of motor-assist bicycles entered the marketplace. 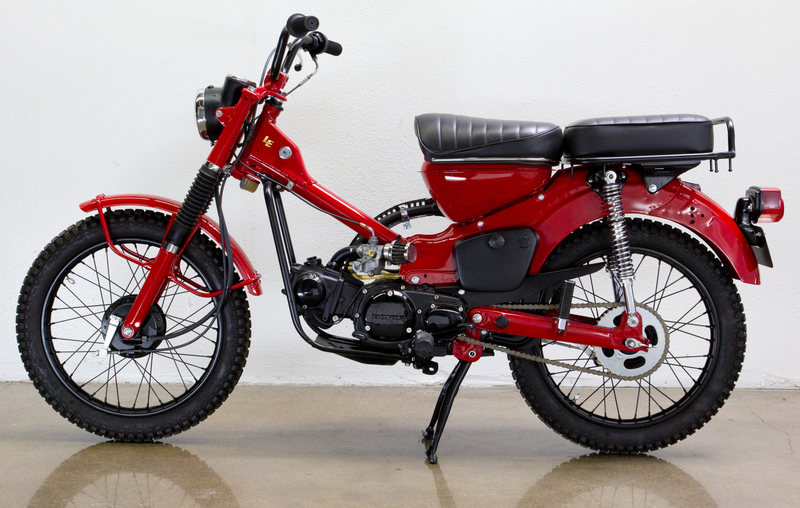 One of the most common was the “moped” which used pedals to start the bike and assist it on steep inclines when the engine was stressed. 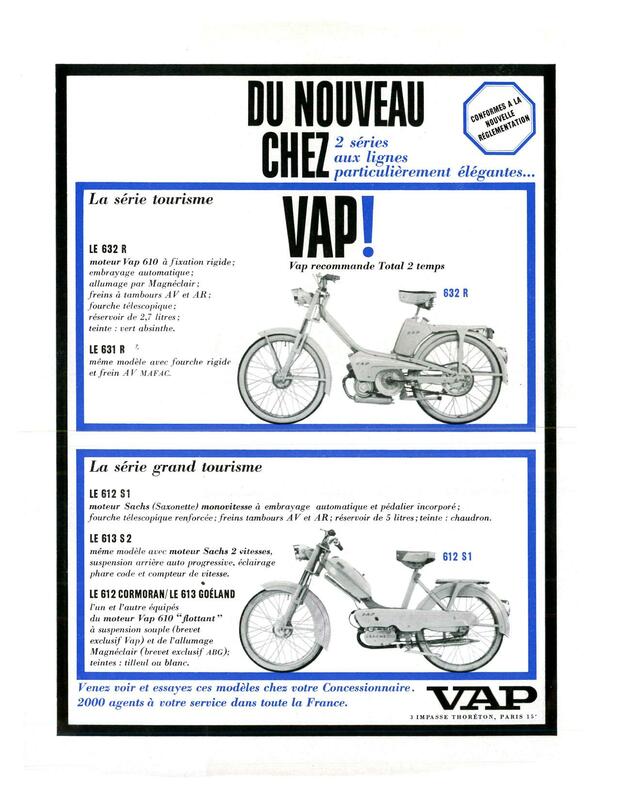 While VeloSolex dominated the market in Europe, many other manufacturers stepped in to provide competition, such as this VAP model depicted above. The above photo depicts Motobecane’s offerings from 1962. 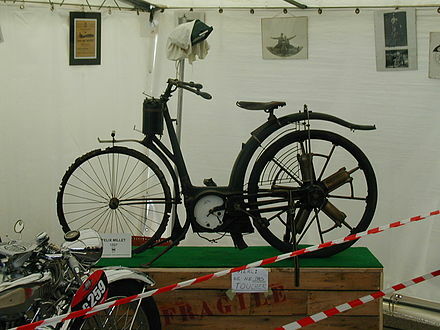 French bicycle builders embraced the idea of motor-assist and many manufacturers offered mopeds and motor-assist bicycles. But are these historic innovations really comparable to today’s e-bikes? 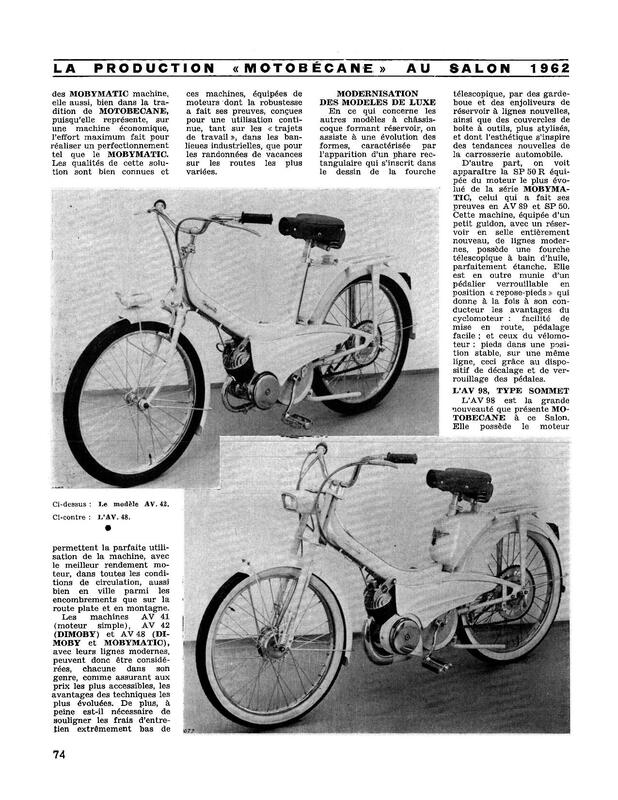 In some ways they are: they attempted to take existing bicycle engineering to add motor-assist to the bike, thus extending the bike’s range and reducing fatigue for the cyclist. Not all vintage motor assist bicycles incorporated the concept of rider pedal assist. And, as is obvious now, gas powered engines, especially 2 strokes engines, are not environmentally friendly. Are e-bikes environmentally friendly? That’s an issue worth exploring, given that the batteries needed to power these bikes require harvesting materials that may have a negative effect on the planet. That may be outweighed by a cyclist leaving their car at home and commuting on their e-bike. And, the health benefits of riding an e-bike have been documented in numerous studies. The behavior of e-bike cyclists was a concern for me initially, but I have noticed that here in Pdx, e-bike riders behave no differently than the rest of us, for the most part. So, I say, if it has two wheels, get on it and ride! This entry was posted in Bicycle commuting, Bicycle history, city cycling, Commuter bicycle and tagged e-bike, moped, Velosolex, Wall Autowheel, Whizzer by Nola Wilken. Bookmark the permalink. You make an excellent point about e-bikes: they can provide the option to ride when traditional bikes cannot. For new riders, aging riders, moms and dads hauling kids, grocery-getting, and myriad other applications, e-bikes offer an enticing pathway to cycling. My first impression of e-bikes is how wonderful they were for commuting. I didn’t consider them as filling the role of pedal bicycles in our pleasures. I’ve since realized how wonderful this type of motorized bicycle is to people with disabilities that might not ride at all were it nor for these designs. Our town is now full of Jump rental electric bicycles. Jump is a subsidiary of Uber or Lyft. They are incredibly popular. They have filled a gap in cheaper, fun, motorized transportation that I didn’t realize existed. People use them during the day for commuting and during the evening for socializing. There are literally hundreds on the road at any one time. How quickly the world can change.